A few years back I got injured. I had an Achilles tendonitis on my left leg, which appeared out of the blue (looking back I do know why and how), but took me almost 2.5 years to fully recover from. Now if you’ve had any kind of tendonitis before, you know it’s not a very bad pain, but it is annoying as soon as it gets chronic, because, in my case, with every step, you get remembered that you are injured. Also there is a risk of rupture, which then opens up a whole other can of worms, you don’t want to experience. Today I want to share with you how I got rid of that injury, and how you can get rid of your neck, back or knee pain so that you can go back to performing at your best. Injuries are a way of our body to tell us, “Hey something is not right, you better listen to me!”. We are so out of touch with our body that we often times don’t even realize when we’re hurting ourselves or injuring ourselves. “If you’re at the gym and you’re moving weight, it’s supposed to hurt!” That’s the pain that champions are made of, right? Wrong. First of all you’re not a champion (yet), so calm down. Neither are you a professional athlete, so stop acting like one when it comes to your movement practice. You have to approach it in a smart way so that your body has enough time to adjust. It was the right thing to do: Everybody was running barefoot and this is the thing that differentiated the knowing people from the unknowing people. So we started wearing them to every training session (hey, they were still too weird to wear during the day) and our warm up was sometimes running around the block. Running in barefoot shoes, when your feet are not used to it and overdoing it, is a recipe for disaster. After the first warmup and training session everything was good, but I felt a strain in my left calf muscle. “That’s just soreness, I gotta keep going!” was the mindset. Fast forward three training sessions and the pain keeps getting stronger. I ignore it again, because it goes away after a few hours. 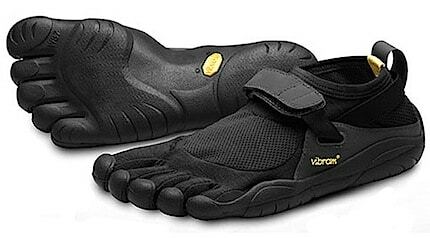 I start wearing those five finger shoes when doing walks as well. Coming back from those walks I felt an incredible pain in my left calf, which I thought again, was just soreness gone wild. I did what every pro athlete does when something doesn’t feel right: Iced and relaxed. But then it didn’t go away the next day. It’d start out in the morning at around 9am, after getting up at around 8am (I was lazy back then) and would continue just until I was going back to sleep. With every step I felt pain. Icing and some physical therapy work didn’t help, I needed to see a doctor. I went to three doctors, who are known doctors in the sports therapy field and are normally treating athletes and other famous people. I thought they will take good care of me because they know exactly what they’re doing. “I’ve never seen feet in such bad shape” was the first answer I’d hear from a doctor, an orthotic and a doctor specialized in knee and foot injuries. All doctors started recommending me orthotics for my shoes and I was only wearing high shoes, with strong support, because anything minimalistic was straining too much on my achilles tendon. I was dependent on orthotics and if you know me, you know I hate dependence on anything. Fast forward about 6 months, 8 physical therapy sessions, 2 shock wave therapy sessions, 3 different foot orthotics and about 4k in stacked doctor bills, that I had to pay myself. Pain almost every day and professionals who tell you “Well that’s just the tip of the ice berg, you’ll have to deal with that for the rest of your life” makes you uncomfortable in your own skin and very desperate. I couldn’t train properly, I couldn’t walk properly and most importantly I couldn’t perform properly at my work. Thinking about pain all the time makes you as unproductive as being stressed and not sleeping. You spend your valuable brain energy on how to get rid of that pain. It was one of my most unproductive times. A friend, who was injured a while back through a horror injury, while doing bench presses approached me and asking me how I’m coping with the injury (out of the blue, mind you, we weren’t talking every day or so). I told him my story and how frustrated I was and he suggested that I’d visit him to see what’s what. He’s not a doctor, but he was studying sports with a focus on biomechanics, so he knew what he was talking about on a higher level. “Your muscles are too tight in the foot and leg area, no wonder the foot orthotics and physical therapy sessions didn’t help. You need massage therapy.” was his diagnose. Massage therapy in my eyes was something you’d get to relax, in a spa weekend or so. Nothing you’d use to treat injuries! He suggested I’d come in for 2-3 times per week and get a lower and upper body massage. It was very convenient for him as well, since he was getting his diploma as a massage therapist, so I could be his guinea pig. And that’s exactly where the desperate behaviour comes in. If you’re desperate you’re seeking out any help you can get, even if the person is unqualified on paper. After you found something that you think might work, you have to trust the process, otherwise it won’t help. So I got massage work done 3 times per week for about 6 weeks, before I started to notice anything. Sometimes it even felt like it was getting worse! My body however, was adjusting. The thing with massage is, I believe that sometimes it has to hurt. I’m not a fan of a dark room, calm music and relaxing massage stuff. That has its place in life, but not for injury treatment and other problematic topics. Of course my massage therapist friend was still learning, but it definitely hurt! Slowly but surely, my injury started to get better and I started noticing other stuff as well. My posture (I’ll tell you more about this next week!) improved and my body looked better, just from massage work. I didn’t train at all, but looked way better in this lean state that I did in the bulked up state before. I did this treatment for about 3-4 months, until we reduced it to 2x per week and went for another 3-4 months on that schedule. All in all it was definitely a long time before it started working, but when it did, it helped me heal entirely. As of now I’m pain free in my tendon area and my entire body feels more stable when doing exercises. Whenever pain occurs in a certain area, I realize that I have been neglecting my prehab/rehab work for some time and that I should get a massage or at least do some work with some foam rolling and lacrosse balls. I thought long about how to implement these learnings into a routine so that I can put this also into an article form. This is a signal that something is off in either your movement pattern or general movement habit. Go to a sports massage therapist and discuss your problem. If the therapist sees the problem zone, keep doing massage work and later on ask for specific exercises with a foam roller or a lacrosse ball on how to get rid of the pain for good. If you have an “off-day” where your neck or back (or any other place) just hurts out of nowhere. Get a massage if you can, but if scheduling isn’t an option or you need immediate results, use something like Traumeel S ointment cream and do some of the exercises mentioned in the PDF. Stop for a second. There are a lot of cases where surgery can be avoided by properly treating the area with massage work and then doing consistent foam rolling work as well as working with on your movement patterns. Look up Ido Portal and go to one of his seminars. I generally do my massage work before going to sleep, because it helps me immensely to relax and calm down after a stressful day of work. I make sure to build it into my evening routine. I’ll go into more detail in terms of exercises and effectiveness in a later post. I’m a not a doctor and I don’t play one on the internet, so make sure that you talk to your doctor before doing any of these exercises. That being said most of these exercises can be done without the risk of injuring yourself, but it’s always good to see the person directly, because these injuries and pain occurences are very personal and depend heavily on your body and movement patterns. However, these exercises can help you manage your injury in a sane way. Next week I’ll show you how you can fix your posture (even at work!) so that you can stay injury and pain-free. You need to be pain-free to be productive good, be it mentally or physically. NOTE: I’m currently trying to organize a free ebook by Mike Robertson, which has a TON of useful exercises for prehab/rehab, enter your email below to get notified as soon as I can get the download ready for you.